In the 11 days since it was launched, One Million Hijabs has drawn 12,370 followers. The murder of an Iraqi immigrant found beaten to death in her San Diego home on March 21 has sparked a Facebook campaign in which scores of women are posting their pictures donning the "hijab" — a head covering the victim wore as part of her Muslim faith. 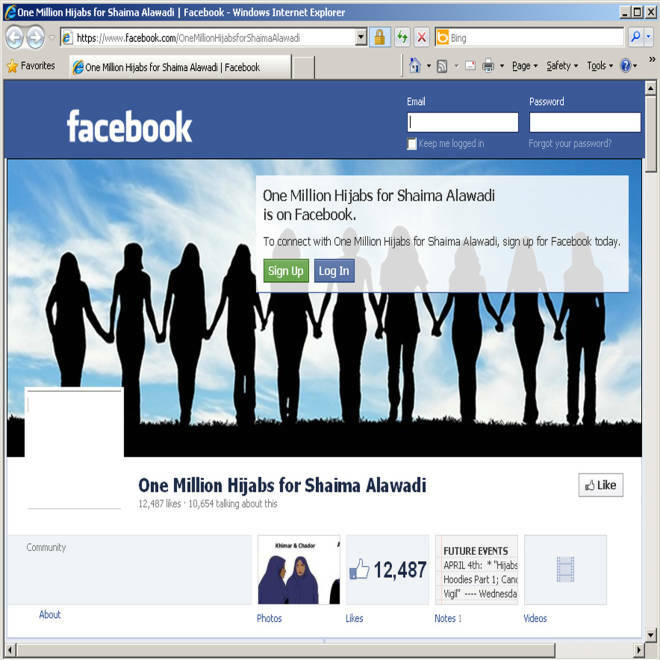 The Facebook page, called "One Million Hijabs for Shaima Alawadi," is based on the premise that her killing was a hate crime because there was a "threatening note" left by Alawadi's body. Alawadi's 15-year-old son, Mohammed — one of her five children — told the New York Times that the note read: "This is my country. Go back to yours, terrorist." Investigators are exploring ethnic and religious bias angles, but they have cautioned about drawing conclusions until more evidence is available. Pictures posted on Facebook by women wearing hijabs. 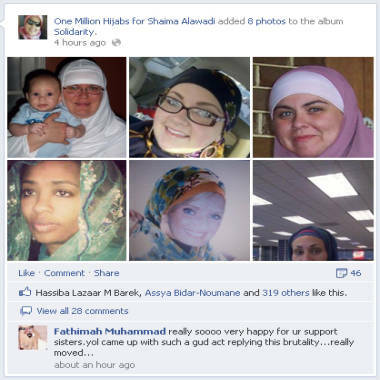 Some are non-Muslims who wore the headscarf as part of a Facebook tribute to Shaima Alawadi. In the 11 days since it was launched, One Million Hijabs has drawn 12,370 followers. Women who identify themselves as Muslims — as well as Catholic, Quaker and "human" — have posted their images wearing scarves. Some say they are wearing the head covering for as long as a month to get the word out about Alawadi's killing. One posting shows a class of students, all wearing a head coverings and holding signs with a variety of messages, including "I am Shaima Alawadi," "I am Trayvon Martin," "I am Buddhist," "I am Love," "I am Bengali," "I am atheist" and "I am Christian." The posting was part of a class project on culture and diversity sparked by the 32-year-old Alawadi’s killing, as well as that of Trayvon Martin, the 16-year-old African American shot and killed by a neighborhood watch captain in a gated community in Florida. MSNBC's Thomas Roberts talks to Sadaf T. Hane, Civil Rights Director for the Council on American-Islamic Relations in San Diego, about the death of Shaima Alawadi. 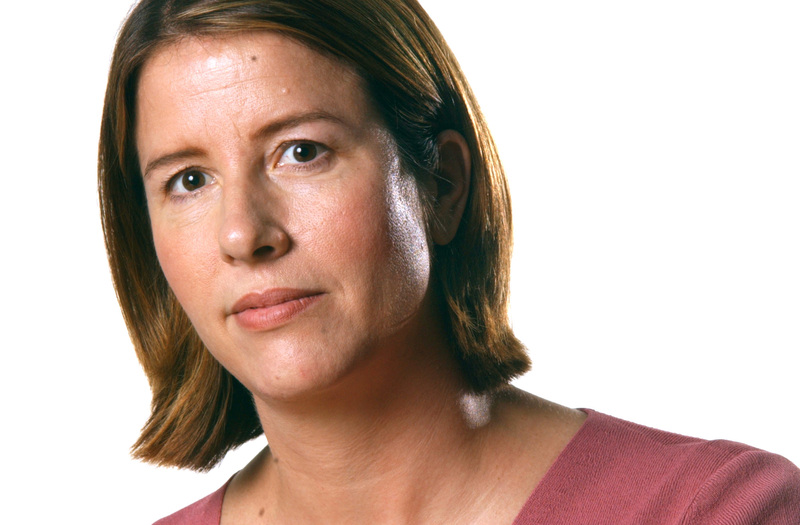 There also have been claims of bias in the Martin case. Though investigations into both deaths are incomplete, the killings have sparked "hijabs and hoodies" events against hate crimes, including a National Day of Action for Shaima and Trayvon on April 11, with rallies planned on college campuses across the country.